Regina, Ed and Ollie aka "The Admiral"
Ask Ed Bacon why he’s been a year-round resident of the 79th Street Boat Basin since 1970 and he’ll point toward 33 Riverside’s penthouse where George Gershwin (likely) wrote a tune summing up his favorite aspect of a Hudson River lifestyle: Summertime. It was hard to be singing “and the living is ea-sy” last Monday evening as 30 mph winds whipped across the water, sending temperatures into the teens and necessitating an ice-dodging step into Prelude, his and wife Regina Jordan’s cutter-rigged ketch. It’s a cozy 70 degrees, however, inside the living quarters he calls, “a very efficient studio with three bedrooms and two bathrooms in about 450 square feet…our womb with a view.” All of the couple’s worldly possessions are tucked away with the tidiness of a black-belt Marie Kondo-ite. Ollie, a 10-year-old Maltipoo otherwise known as The Admiral, supervises operations from a newly upholstered settee/dining-bench/guest bed. 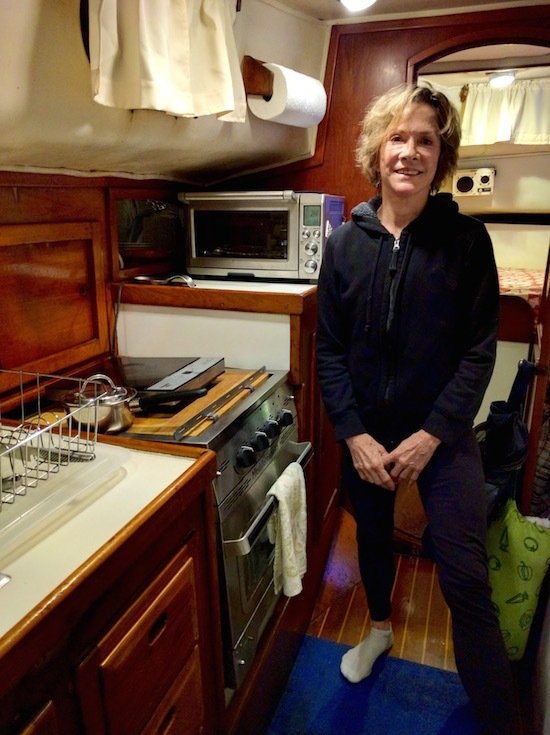 The boat is their office as well as home, equipped with Time Warner Cable Internet, TV, VoIP phone and a ConEd electrical account. 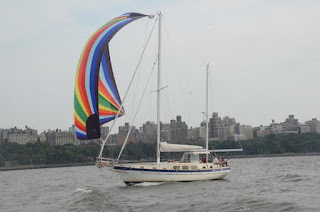 Through All NYC Yachts they broker local yachts of all sizes for all occasions, as well as charter Prelude for events and engagement cruises, catered by chef Regina who’s also a personal fitness trainer. 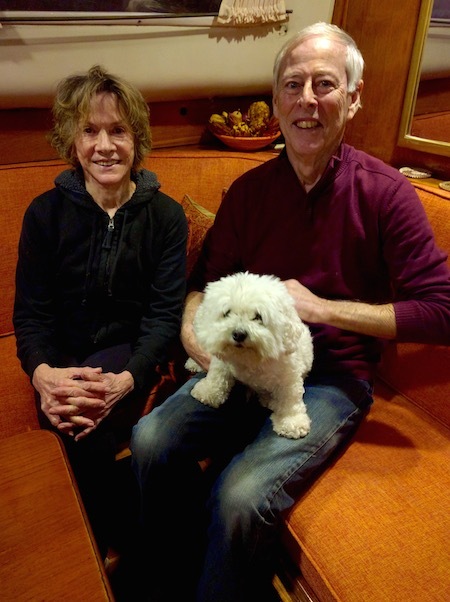 In a freewheeling conversation, Ed, 75, and Regina, “let’s say 58”, spelled out some of the benefits and drawbacks of life on the UWS waterfront. Following is an edited version of our chat. WSR: NYC’s Parks Department is essentially your landlord. How does that work? EB: Parks issues our permit once a year. We used to have contracts, but now we have as many rights as a Central Park hot dog vendor. WSR: Parks could choose not to renew your permit at any time? EB: Yes. They could nail us for violation of some regulation. Parks marinas have 20+ pages of regs. RJ: It’s cheap, but you get what you pay for. EB: For a full-year permit, it’s $225 per foot (of boat); plus another $3000 a year or so for a parking space in the rotunda lot behind Boat Basin Café. WSR: So a 30-footer [the minimum size] would be $6750 a year, $563 a month. That’s a great “maintenance” fee compared to a co-op. Our “super” never enters our boat. You have to provide your own maintenance for the electric, the water pump, the heating system for the water and rooms. We have to sail over to Liberty Landing in Jersey City fill up the diesel tank that runs our engine and heating. There’s no A/C. Insurance requires coverage for the entire boat, not just its contents unlike a co-op shareholder’s policy. Any replacement furnishings are boutique purchases that cost more. You can’t get a stovetop that tilts with the tides at any appliance store. And your Coast Guard safety equipment must be in place and in good condition. Tremendous, constant elbow grease is required to keep the boat looking ship-shape: Scraping hulls, repainting, varnishing the gleaming Burmese teak and holly floors, polishing brass. Wakes from the Moira Smith ferry between Edgewater, New Jersey, and Pier 79 at 39th Street are like a motorcycle running down your hallway 31 times a day. We get hammered. When you sell your co-op, you’re really selling your location. But when we sell a boat, we have to get it out of here. The permit doesn’t transfer with the boat; there’s a waiting list seven or eight years long to get one. Your co-op likely appreciates in value; boats depreciate. RJ: Why the hell do we live here? (laughs) It’s hard work. I call myself a pioneer woman. WSR: I did see you have Prelude up for sale. You’re not leaving? EB: No. We’re looking to switch. Modern boats are like Clorox bottles: low maintenance. WSR: Has the Boat Basin community changed much in your 45 years here? EB: We used to have about 104 year-rounders; now it’s down to 33 boats. It’s always attracted an eclectic group of people and they are the best thing about the Boat Basin. However, as in most UWS neighborhoods, homogeneity is being force-fed by the City. WSR: How could Parks serve Basin residents better? EB: We’d like more communication from the top. Nobody knows where this marina is going. We asked to be involved in the process as various infrastructure projects have been planned. But [it didn’t happen]. RJ: Communication has been a real struggle for at least the past nine years. WSR: What makes it worth all the hassles? What do you love about living here? RJ: There’s a lot of freedom in the summertime. We sit outside and have cocktails with company or watch TV; it’s pleasant. And the sunsets in winter! They are the most beautiful I’ve ever seen and we’ve been to the Caribbean, all over. EB: Again, it’s the people. I like to say, the farther west you go in Manhattan, the weirder it gets. And we’re as far west as you can go.